NASA Administrator Charles Bolden speaks to the media at Johnson Space Center May 16, 2013, from the Space Vehicle Mockup Facility. HOUSTON — Charles Bolden, NASA's chief and a self-described dreamer, says there is a line between dreams and reality when it comes to what the space agency can do, especially in light of current budget constraints. "I am the eternal optimist, but I am also a realist," the NASA administrator told reporters during a visit to the Johnson Space Center here on Thursday (May 16). "Every single thing that we have on our plate right now, an asteroid mission, Mars, those are all very realistic. We know conceptually how to do that. We don't have all the technological capability to do it yet." Bolden, who was in Houston to address employees and briefly visit with Chris Hadfield and Tom Marshburn, who returned from the International Space Station (ISS) on Monday (May 13), spoke about the priorities set out for NASA in President Barack Obama's budget proposal for next year. But budget constraints, specifically the sequester currently affecting all federal agencies, may put some of those priorities into jeopardy of being delayed or canceled. "If the President and the Congress are not able to solve the sequester issue, which is a 10 year problem, we're in trouble," Bolden said. "If we have to operate under sequester, in 2014, NASA's budget goes from the present $16.8 billion — it will not go up to $17.7 [billion] — it will go down another $800 million to about $16.1 [billion]. That's significantly below the level of spending that we have right now." Bolden said that if NASA doesn't get out from under the sequester, he may have no other choice but to remove some of the priorities from the space agency's very full plate. "If it goes down to that point... you could see us go to the White House, go to the Congress and say 'Okay, you all didn't solve the problem, we now have some of our priorities that are going to come off the plate,'" he said. "The only solution without destroying the agency will be to say, 'Okay, we're not going to do that priority.' That will upset a lot of people, but that's reality." For now, Bolden has committed to working within the space agency's means. That applies to NASA's newest proposed mission, robotically capturing and moving a small asteroid to the vicinity of the moon, where astronauts will then explore it and collect samples to bring back to Earth. Originally, when challenged by Obama in 2010 to send astronauts to an asteroid by 2025, the plan did not include retrieving the space rock first. "I am a typical person, I think," Bolden told SPACE.com. "When the president said we're going to send humans to an asteroid, the first thing that came to my mind was that we were going to send a big rocket somewhere between Mars and Jupiter to the primary asteroid belt and go rendezvous with an asteroid. We were going to take years to go do that, I mean literally years and years." "[But] when we looked at our budget and we looked at the technological capabilities that we have, we said that is not likely to happen, not only not by 2025, but maybe not in our lifetime, so let's find another way to put humans with an asteroid," he said. Finding that other way will get underway in earnest over the next couple of months. 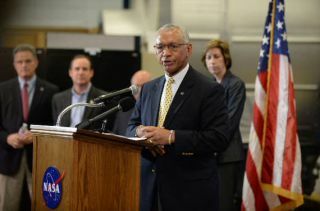 "We have a mission formulation activity that is going to start this summer where all of our NASA centers, academia, industry and our foreign partners will come together to try to hone in on what that mission will really look like," Bolden said. NASA Administrator Charles Bolden (R) and Johnson Space Center Director Ellen Ochoa talk to Expedition 35 astronauts Chris Hadfield and Tom Marshburn May 16, 2013, just days after their May 13 landing in Kazakhstan. Even if NASA had an unlimited budget, Bolden said he would stay the current course. "If you look at NASA's budget today, the budget request, that is where Charlie Bolden would be if I didn't have to worry about budgets, if I had an unlimited budget," the NASA Administrator told reporters. "What I would do, I would not add another program to NASA's portfolio. I would buy down risk on the programs that we have underway right now." That applies to both manned exploration and robotic planetary missions. "Everybody needs to understand that the days of NASA doing a flagship mission a year are long gone," Bolden said, referring to the billion dollar or more robotic flagship missions such as NASA's Curiosity rover on Mars and the Cassini probe at Saturn. "We don't have the budget to support flagship missions right now. The Congress has not put any money in NASA's budget for a flagship mission in this budget cycle," Bolden added. "They could do it. I would hope not because we have a pretty good plan as it is."